How to choose between Agile and Lean, Scrum and Kanban — which methodology is the best? Over the past 20 years Agile and Lean, Scrum and Kanban have been steadily gaining popularity in various fields and industries, and rightly so. According to the Project Management Institute and its Pulse of the Profession 2015: Capturing the Value of Project Management 2015, 75% of highly agile organizations met their goals/business intent, 65% finished on time, and 67% finished within budget, which is higher than what organizations with low agility achieve. The same research shows that agile organizations grew revenue 37% faster and generated 30% higher profits than non-agile companies. Lean Startup principles have proven their effectiveness too. So thanks to lean approach, Dropbox went from 100,000 registered users to over 4,000,000 in 15 months; Wealthfront company now manages over $200M and processes over $2M a day; IMVU has reached 50 million registered users and a $40+ million annualized revenue run rate. Although many companies are currently implementing or leaning towards these modern methodologies, usually there are only a few people in the company who understand the whole process from A to Z (Scrum Master or Lean Manager). Other employees, especially if they are in big companies with complicated communication systems, follow the rules without deep insight. It doesn’t mean that they are bad at work, it could be just the opposite — they may be focused on their functional tasks (which is good). But as long as they do not know the basic principles, do not share corporate philosophy, are not ready to challenge one another, or cannot distinguish between Agile and Lean, Scrum and Kanban, their company will not see any change in productivity. is it possible to choose which methodology is the best. Feel free to share the article with your staff, to make sure that they never get lost in the most popular management methodologies, and understand the basics behind the practices that could be applied in your company. Why Agile and Lean, Scrum and Kanban were born and became popular? The first reason is the mother of all changes that happen in the business world — it’s market competition. 100 million businesses are launched every year, according to figures from GEM Global Report. And everyone wants to bite a bigger piece of the delicious market cake. Being agile or lean is a modern way of adapting and surviving in the face of enormous competition. The second reason is the rapid growth of IT and Software market, that introduces other industries to Lean and Agile mindsets. Exponential growth is essential to the technology industry, and tech companies know their way around processes that enable and support it. But for slow traditional companies it sometimes appears to be some kind of magic tool. Software Development methodologies are perceived in traditional industries as hacks, so the number of managers who want to try them increases every day. The next reason is the trend toward perfectionism. This is what makes me feel proud for the ages we live in — there are hundreds of entrepreneurs who want to make products of the best price and best quality. 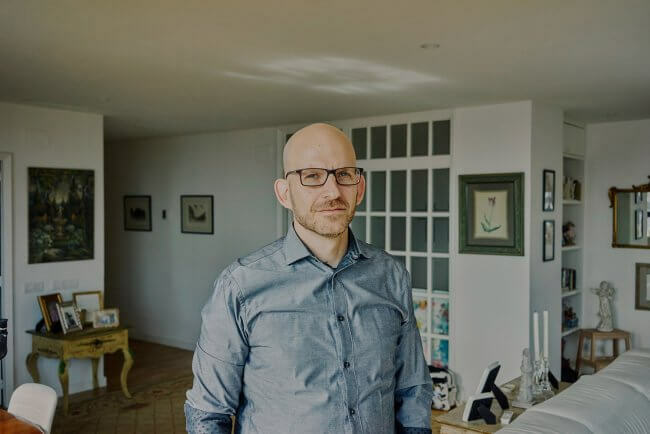 They live and work to produce legendary things, and they are ready to implement complicated management methodologies not only to win employees’ and customers’ hearts, but to be recognized (even across competitors) as leaders of iconic companies. The last reason is the modern employees’ demands. It’s not a secret, that proper management reduces stress, overtiming, increases welfare and satisfaction. In the 20th century people just wanted to work, and that is why traditional management was focused on the endless production cycle, considering the workforce as a part of this perpetuum mobile. Modern employees are very demanding and generally aim to work in a flexible company with a perfect process management system. What are the differences between Agile and Lean, Scrum and Kanban? Officially Agile was born in 2001 from Agile Manifesto to improve productivity in software development, but it’s now expanding into other areas (f.ex. Marketing). Any project team that follows the values of 12 Agile principles can be considered ‘agile’. 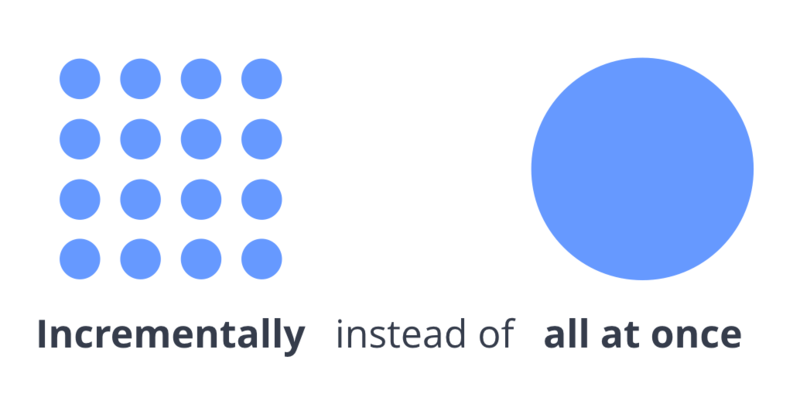 In a nutshell Agile is a time-focused, iterative philosophy that allows to build a product step-by-step (incrementally), delivering it by smaller pieces. One of its main benefits is the ability to adapt and change at any step (depending on feedback, market conditions, corporate obstacles, etc.) and to supply only relevant products to the market. Simple visualization of agile processes. That is why an agile company is usually very flexible, quickly adapts to changes, iterates less while implementing faster, and is able to seize new opportunities as they appear. It enables a fast decision-making process through flexible organizational structure and simple communication. 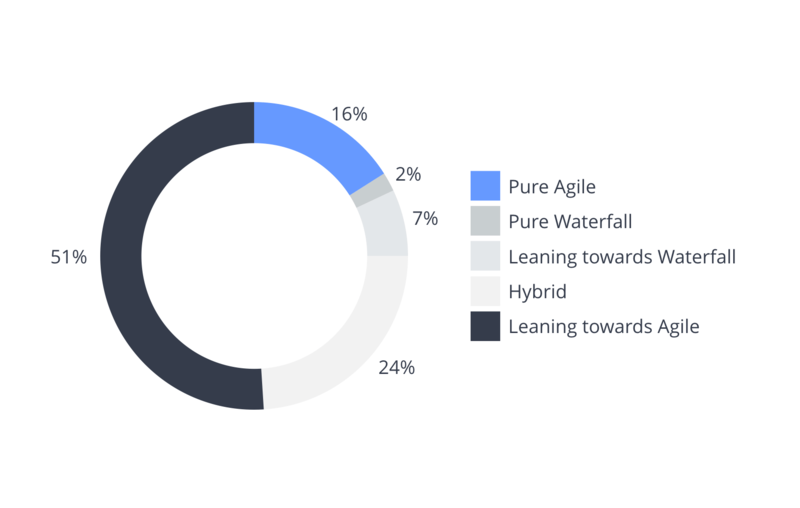 The research among 601 development and IT professionals conducted in 2015, shows that nowadays Agile is the primary management approach. And they mostly use it to enhance collaboration and increase the level of software quality. Initially, Lean movement was born in Japan in the mid 1950-s in manufacturing industry (automotive industry) and was mainly aimed at loss reduction and sustainable production. In 2000-s Lean was also adapted for software development by Mary and Tom Poppendiecks who related it with 7 initial Lean principles and Agile philosophy. 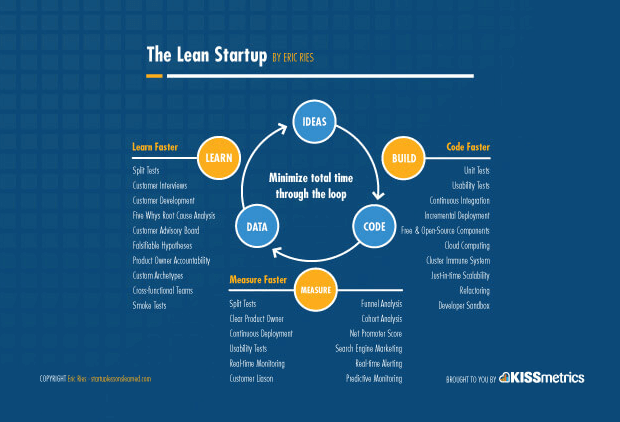 Following the trend that Lean could be extended to any industry, Lean was applied in the startup industry in 2008 by Eric Reis as a way of developing “new products and services in circumstances of extreme uncertainty.” To be considered ‘lean’, a startup should follow the values of 5 Lean principles by Eric Reis. Learn about the four 2018 collaboration trends that drive the adoption of virtual whiteboards. A typical lean company follows a learn – measure – build cycle, and conducts many tests, frequently connects with customers, understands their value and focuses its key processes to continuously improve it. A never ending cycle leads the startup to sustainability, smart development and success. While reducing the high costs of getting the first customer and even higher cost of getting the product wrong, and shortening technology development cycles, Lean Startup philosophy helps new ventures launch products that customers actually want, far more quickly and cheaper than traditional methods, making startups less risky. Description of Lean Startup action loop. Source: Kissmetrics. As you can see both agile and lean are aimed at achieving business goals and delighting clients with a competitive product of the best quality. These and many other shared features between the two mindsets often lead to people mixing them up. However, they serve different purposes and tasks, and that is why it’s important to draw a clear line between them. Actually, there is a trick in the name of the article — Agile and Lean are not exactly methodologies. Specialists still argue because Agile and Lean principles are a basis that can be applied to different methodologies (f.ex. Scrum and Kanban), so it would make more sense to refer to them as mindsets or philosophies. Methodologies: Scrum, XP, FDD, DSDM, Crystal Methods etc. Toolkit: sprints, boards, Scrum Master, acceptance tests, user story mapping etc. Toolkit: hypotheses, split (A/B) tests, customer interviews, funnel and cohort analysis, Customer Success Manager etc. The term Lean is wider than Agile because its smart approach influences all types of losses (not only time loss) such as money, labour, energy, etc. Moreover Jeff Sutherland points that Agile was born after Lean, so they are closely related. Conceptually Agile is a subset of Lean principles and practices which are in turn a subset of Systems Thinking. Now let’s get down to the level of methodologies. According to scrum guru Jeff Sutherland, Scrum definition is “a framework within which people can address complex adaptive problems, while productively and creatively delivering products of the highest possible value”. He wrote a bestselling book describing Scrum in a nutshell. The fundamental principle of Scrum points that by splitting time, product and organization, you optimize the process and guarantee impressive results. In other simple words: to get into Scrum a company should establish small teams and give them small tasks for short periods of time (f.ex. 2 weeks sprints). The progress needs to be tracked on Scrum boards which have the following sections: backlog, to do, in progress, and ‘done’ tasks. Scrum board vs. Kanban board. What’s the difference? There’s a good article we wrote on 11 major differences. You can find more information about Scrum methodology, Scrum teams, Scrum events, Scrum artifacts and the importance of defining the ‘done’ status in Jeff Sutherland’s Scrum Guide. 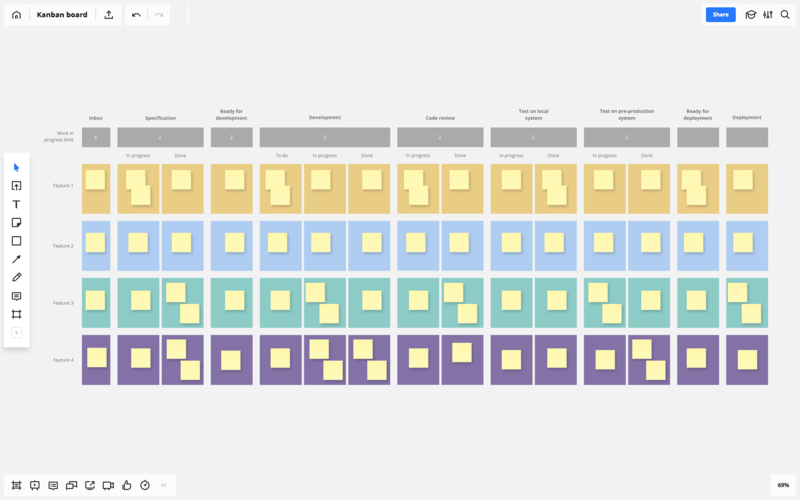 Kanban is a scheduling system of visual management aimed at just-in-time delivery excluding team overloading. As a part of Lean, initially the methodology supported japanese automotive industry. Similarly to Scrum, Kanban tracks ‘to do – in progress – done’ activities, but it limits them by the number of ‘work in progress’ activities (the number is defined by the team manager and cannot be exceeded). Basic comparison between Scrum and Kanban was made about five years ago by Henrik Kniberg. In this presentation Hendrik describes similarities and differences between Scrum and Kanban in simple terms and with clear visualization. As stated in the presentation, both methodologies follow the principles of Agile and Lean. They track processes via scheduling system to ensure transparency, and they are managed by devoted teams. Both methodologies limit the amount of work in progress (Scrum limits them by time units — iterations, Kanban limits work in progress per workflow state). Also Scrum and Kanban focus teams on breaking the work into pieces and supplying the releasable parts of the product earlier and more often. 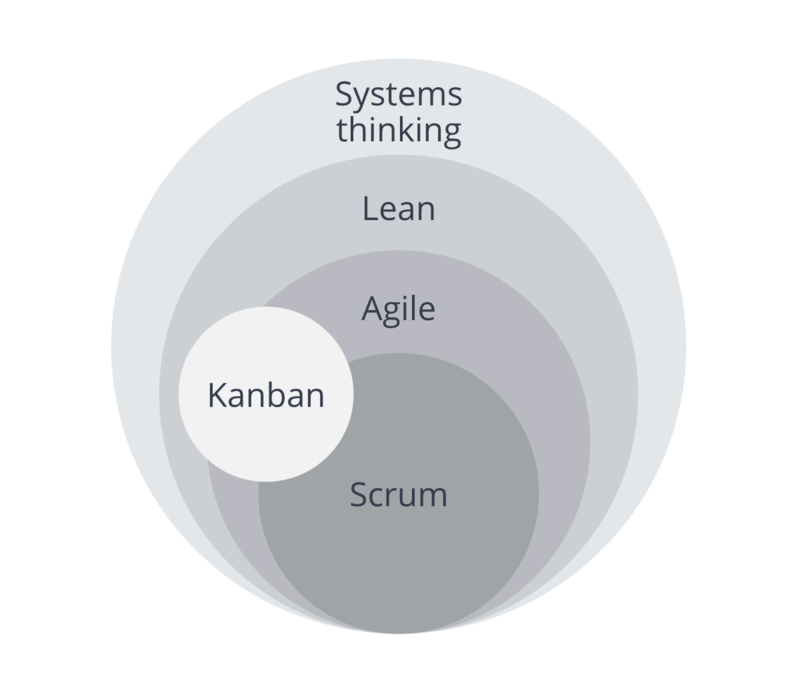 Despite these similarities Scrum and Kanban are not the same, and the image below illustrates some of the differences. There is also an article comparing Scrum and Kanban boards, so you would easily distinguish what is what. At this point you should feel much more comfortable speaking about Agile and Lean mindsets and methodologies, or at least get a basic understanding of how they relate to each other. Now let’s see how this knowledge can be applied in a real-life scenario. In this part of the article we’re switching our focus to practical implementation of Agile and Lean, Scrum and Kanban. We will cover 4 basic use cases — and there is a dedicated template for each of them available in RealtimeBoard. To use these and other templates, click on the Insert button, select Choose a template and go to the Agile category. We only got a chance to cover one practice per each methodology (and philosophy), but there are many other ways to implement Agile and Lean, Scrum or Kanban inside our tool. We would love to hear your stories and feature them as case studies! Feel free to share your experience in the comments field or send us a message at hello@realtimeboard.com. By using the above mentioned canvas templates you can analyze whether your company focuses on addressing real customer problems and proposes a unique value to them. 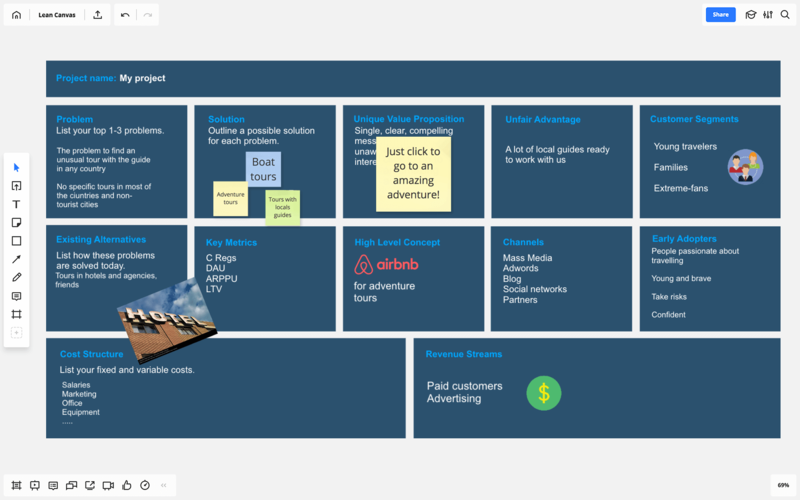 Things to try in RealtimeBoard: Business Model Canvas template or Lean Canvas template. Useful tip: analyze your customers’ demands before creating the board, and do not forget to share it afterwards with the whole marketing team to ensure that you didn’t miss anything. 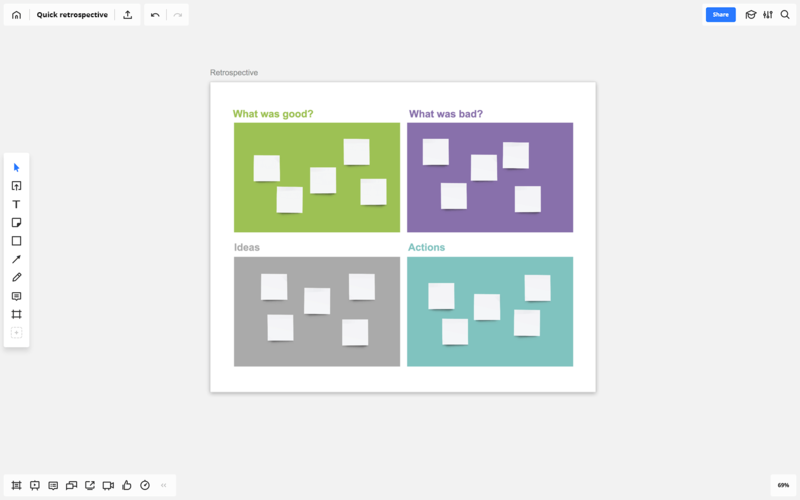 No matter whether you are dabbling in Agile or already running a productive Agile team, it’s always helpful to conduct visual retrospective meetings, because they are the key to deep understanding of success and failure root causes. to make the meeting more productive, close every brief retrospective with reflecting in order to increase engagement and improve teamwork. Add ideas to the board and start the next retrospective meeting from recalling how you wanted to improve in the previous meeting. If you decide to implement Scrum, then you should definitely be using an Agile board. Using an online whiteboard will help you manage remote teams online and in real-time, keep the story safe in the cloud, and save time by using a pre-ready template. Useful tip: do not delete stickers when the project is finished, and use them during retrospective sessions. 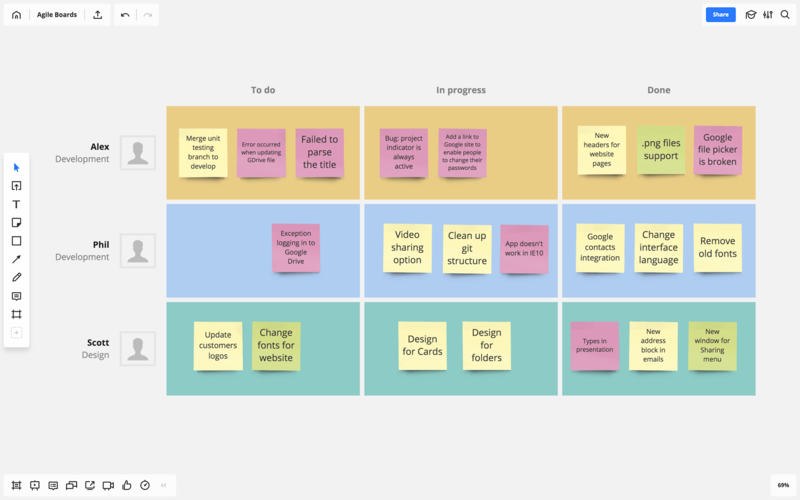 If your developers are overwhelmed with an endless to-do list, you should definitely look into managing the process with Kanban board, which limits the number of ‘work in progress’ items at each step. 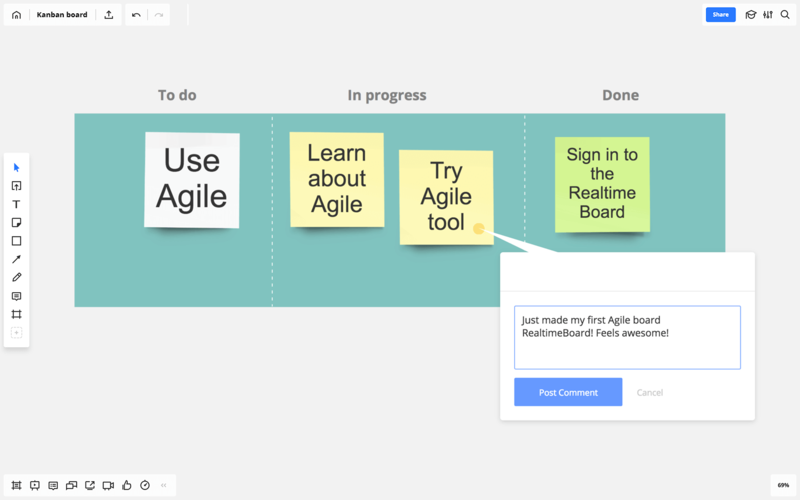 You can use the Agile board template or create your own board and customize it to your team’s needs. Approaching the end of the article, you might have realized that it’s impossible to pick one methodology or mindset and confidently say that it’s better than the others. They are almost incomparable and their final rank depends on the kind of problems you are trying to solve. Moreover, it appears that the best results often come from combining various techniques and practices. But before going out to create a customized project management mix, take your time and make sure you’ve got the basics down. It’s definitely worth trying to implement these mindsets as they were originally intended, and only then making certain changes to optimize them for your company. In this case by improving the existing practices you will be expanding the toolkit instead of creating new processes that might fail to work and contradicting with the principles of Lean and Agile! We wish you happy agile planning!